Lightbox Signs Illuminated Translucent Posters Measuring 11x17! 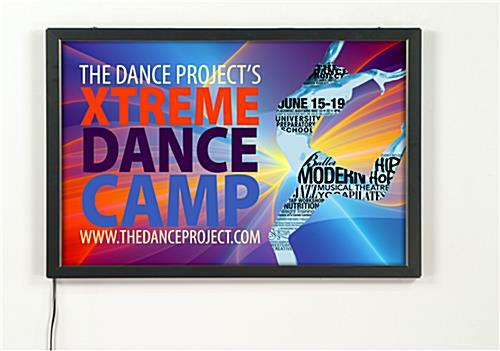 Light Boxes & Many Other Signage Supplies are Stocked by the 100s for Expedited Shipping! 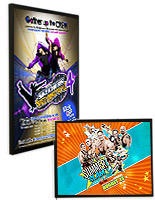 22" x 28" 24" x 36" 27" x 40" 27" x 41" 30" x 40" 36" x 48"
Holds 11" x 17" posters with snap frame technology. Black colored frame to match with most images and envrionments. Metal frame features rounded corners for increased safety. Which Lightbox Signs Should I Buy? 2-chip LED technology results in above average luminance. 3-chip LED technology for extra-strength luminance, approx 70% above Economy models. 6mm acrylic, light guided panel. 8mm acrylic, light guided panel diffuses light more powerfully. Thin profile (.83") is ideal for use in walkways or busy indoor environments. LED bulbs can last for up to 11 years of continuous usage! Satisfactory LUX readings demonstrate brightly-lit presentations. Inexpensive prices allow for higher quantities to be purchased. Low energy costs. Learn more. Holds standard-sized 11" x 17" prints. Scarce light diffusion may result in hot or cold spots. No switch to turn light boxes on or off. Businesses of all types use lightbox signs to display their custom signage. 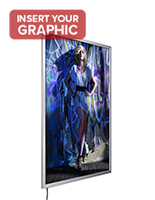 These particular light boxes feature an extremely low profile, measuring .83" in depth. Lightbox signs with an ultra slim design, such as these backlit displays, are perfect for use in high-traffic areas as they do not protrude far from the wall, or obstruct walking paths. Each light box is designed for use with signage printed on translucent poster material. 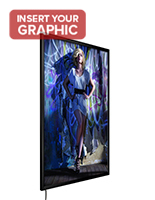 LED backlit lightbox signs then illuminate your displayed advertisements to attract attention. Light box frames with LED lighting are designed for extended use, such as in commercial or business settings, as the bulbs last approximately 100,000 hours of continuous usage. The bulbs of the lightbox signs are embedded in the sides of the frame, concealed from view. LED lighting is lower voltage than many other models on the market, resulting in less energy consumption. As a result of this lighting technology, these are lightbox signs that are in expensive, both in upfront costs as well as in maintenance and overall usage. 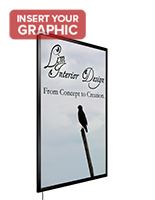 These signage display frames come feature a snap open framing for ease of use. Lightbox signs that display advertisements can therefore be changed in mere minutes! 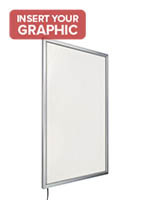 These light box poster frames for business use are designed for wall mounting. 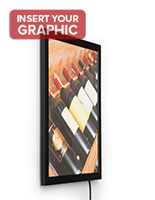 Each frame comes with the necessary hardware for mounting on most surfaces. 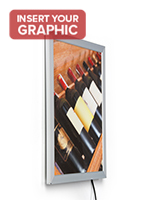 The snap open framing of these lightbox signs that are backlit enables users to simply clip open all four sides of the frame for easier access to the displayed posters. These custom signage display units include an acrylic light guided panel to diffuse light across your graphics. Each indoor light box also comes with a non-glare lens to prevent certain lighting within your business from hindering the view of your signage. 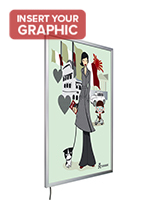 Please Note: These lightboxes are designed for use with custom graphics printed on translucent poster materials only. 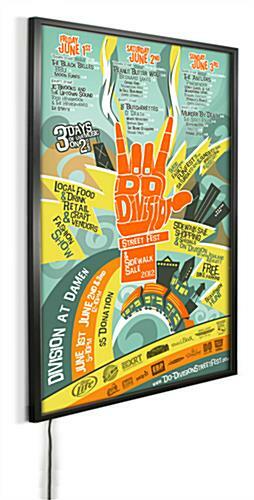 Overall: 12-5/8" x 18-5/8" x .83"
Graphic Size: 11-1/8" x 17-3/4"
12.5" x 18.5" x 0.9"